Google Student Blog: It's a bird... It's a plane... 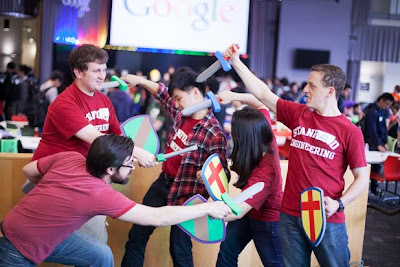 It's Google Games 2013! It's a bird... It's a plane... It's Google Games 2013! Throughout the course of the day, teams of five went head to head in challenges developed by Google engineers specifically for the event. Their goal was to see who had the power to score the most points! The day kicked off with trivia with questions such as “What is the opposite of Brobdingnagian?” and “The Scarlet Witch and Quicksilver are two children of this super-villain.” From there, teams tackled seven logic based puzzles, and by the time lunch rolled around, teams were ready to refuel and recharge for the second portion of the day. This year, we reintroduced Word Association (a Google Games version of shygypsy.com/farm) and challenged teams to be the first to uncover 95% of the word graph. In true Google Games spirit, the culminating round was the coding challenge, where we posed four problems to the teams via the Code Jam platform. But it didn’t end there! It wouldn’t be Google Games without a Lego challenge, and this year we included it as our bonus round. The team with the highest point-scoring tower, based on height and the number of super heroes on the tower, received a special honor of their own. Los Angeles - Team Beavers (Caltech), 3-time winning streak! We could not have hosted these 12 events without the help of our trusted Google engineers, who created all of the challenges and helped on-site, too, so a huge shout out to them! Check out our photo album to see more pictures, and don't forget to add Google Students to your circles on Google+ to learn more about next year’s competition. Just like Superman, Google Games made its return in 2013. This year, we invited over 1,000 students from 39 universities located near a Google office in North America to join us for a day of fun and a glimpse of Google culture. The day included trivia, puzzles, word association, Lego building and coding, all of which happen to be a few of Googlers’ favorite activities. To add to the fun, we encouraged students to reveal their alter egos by donning capes and other super powers.